In Canada, we hear that Enerkem has tested and validated the production of fuel-grade bio-DME made from unrecoverable carbon-rich municipal solid waste. More than 1,000 hours of operations at its Innovation Centre in Westbury, Quebec have been completed.has successfully produced renewable bio-dimethyl ether (Bio-DME), a by-product of biomethanol. Last month we reported that highly fuel-efficient new engine designs could significantly reduce the environmental impact of vehicles, especially if the engines run on renewable non petroleum-based fuels. Ensuring these unconventional fuels are compatible with next-generation engines was the aim of a new computational study on fuel ignition behavior at King Abdullah University of Science & Technology. The team used computational analysis to investigate methanol-DME combustion chemistry. Because combustion is too complex to efficiently simulate in full, the researchers first generated a skeletal model of the process in which peripheral reactions have been stripped away. How does Enerkem do it? The biomass-rich waste conversion strategy into olefins and drop-in fuels begun to be developed experimentally on April 22, 2013. In such strategy, synthesis gas produced by gasification of the waste is converted into DME by two approaches: (1) the syngas is converted into methanol and the latter is converted into DME; (2) the methanol synthesis and the dehydration reaction are carried out simultaneously in the same reactor yielding directly the DME and shifting the equilibrium to a higher conversion of methanol in one pass. The work related with DME synthesis by both routes (1) and (2) is now completed. Bench tests related to the transformation of DME to propylene were started during the summer of 2014, with ZSM-5 zeolite as the active catalyst which was prepared as an extrudate (i.e. a pellet). The major player in the DME movement as headlined above is Oberon Fuels, which produces DME from syngas via methanol. The Oberon production units use various feedstocks—such as biogas (animal and food waste, wastewater treatment, landfills), natural gas, and stranded gas—and they produce 3,000–10,000 gallons of DME per day. 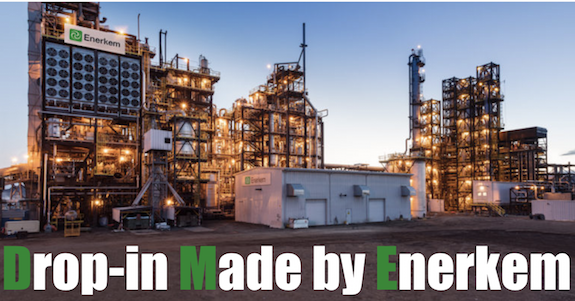 Enerkem has been famously focused on MSW as a feedstock and has a small commercial-scale facility operating in Edmonton, Alberta. But from Washington, a booster a few years back,$740,000 for an NREL project for Scaled Production Of High Octane Biofuel From Biomass-Derived Dimethyl Ether,. That’s was the partnership with Enerkem. It might as well decode it, DME that is, as Despite Meaningful Evidence, Doubt Market Enthusiasm. San Diego-based Oberon Fuels has been the one consistent champion on the “what are we doing about energy security?” circuit in terms of DME. It’s the drop-in that gets dropped out, but NREL’s been a champion, Volvo’s been backing it without blinking, and Enerkem too. Right now, for Oberon the substantial value lift is concerting methane to methanol, where low-cost natural gas (available in the $3/MMBTU range) can be converted into $19.82/MMBTU methanol. The math is not quite as rosy in converting methanol to a diesel substitute right now — because fossil diesel is priced at $16.15/MMBTU at this time, and the up-conversion only makes sense if the methanol has no place to go. If you can imagine an 177-page love letter, but written in the form of process description, diagrams and High Technoeconomicese, that’s this one. Before we break out the bubbly, consider these sober words from Zhihong Yuan and Mario R. Eden of Auburn University, together with Rafiqul Gani at the Technical University of Denmark, writing in I&EC Research, here. Although the importance of hydrogenation of CO2 to CH4 has been emphasized in several reviews and perspectives, the current low natural gas price and the high capital/operating cost of the methanation process prohibits the thermodynamically favorable hydrogenation of CO2 from being implemented economically on a large scale. Using an optimiztic estimation, where the selectivity and conversion rate of the methanation catalyst is assumed as 100% and 50% and the renewable H2 production cost is assumed as 2 US$/kg of H2, producing 1 kg of methane will cost at least 2 US$ for the required H2. Clearly, producing high-volume-low-value liquid fuels and high-value-low-volume chemicals from the hydrogenation of CO2 may offer more economical benefit. Nevertheless, no matter which production route will be adopted, two simple principles should be kept in mind when deciding on the products and designing the process for CO2 conversion: using more energy to produce a lower energy content material makes no sense; and the CO2 emissions from the entire conversion process must be less than the amount of converted CO2. Compared with the CO2-derived methanol synthesis process MegaMethanol, under similar conditions, the CO2-derived DME synthesis process MegaDME shows lower productivities, but also lower byproduct contents. (181) Furthermore, this DME synthesis process is ready for large-scale implementation and therefore provides a promising alternative for large-scale CO2 conversion.